Current policies in health and education promote, and at times mandate, collaboration and partnership between professionals and family members. The Family "Discipline" can be defined as "...that body of knowledge about the child/family member with a disability, that is inherent to the family, acquired by life experience and affected by culture and community." (Center for Learning and Leadership, 2006). Over the past decade there has been an emerging role in LEND programs for a Family faculty member to provide interdisciplinary teams with an invaluable perspective in the scope of their training: the perspective of the family. This role is unique in that the experience of being a family member or parent of an individual with a developmental disability cannot be learned in any university course. More information on activities of LEND Family Faculty and Family Discipline trainees can be found below. 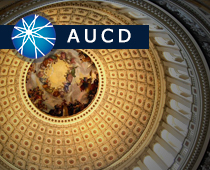 If you have questions about the Family discipline or LEND, contact Sarah DeMaio at AUCD. Rubinstein-Taybi Syndrome (RTS) Event at the Newport Aquarium On the last weekend in January, the UCCEDD at Cincinnati Children�s hosted an RTS booklet release party at the Newport Aquarium, drawing over 100 guests from as far as Michigan, Illinois and Tennessee as well as regional guests from Indiana, Kentucky and Ohio! The booklet, �Understanding Rubinstein-Taybi Syndrome: A Guide for Families and Professionals� was developed to help family members of children with Rubinstein-Taybi Syndrome better explain their child�s condition to healthcare providers, teachers and family members. The booklet and event could not have happened with the generous support of the Dr. Jack Rubinstein Foundation at Cincinnati Children�s. HHS leaders had an opportunity to see this inclusive model in action and learn about the innovative partnership between the Georgetown University Center for Excellence in Developmental Disabilities (UCEDD) and Easterseals DC MD VA that makes it possible. HHS Deputy Secretary Eric Hargan, Assistant Secretary of the Administration for Children and Families Lynn Johnson and ACL Administrator Lance Robertson visited several classrooms and met with staff and parents at the center to hear about how the program works and the difference it has made for families. Zika and other health care updates, new housing resources, Complex Rehabilitation Technology and Medicare, Family Support legislation. Promoting healthy development and treating children's health issues enhances their readiness for school. The Office of Head Start's National Center on Health released a new interactive online tool, Making the Link Between Health and School Readiness (2014), which is designed to help early childhood program leaders integrate meaningful health strategies with school readiness goals. Competencies for LEND Family trainees, created in 2006. Created by Family Faculty in 2006, this Guidebook describes Family Mentorship activities in MCHB LEND programs.